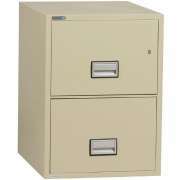 Hertz Furniture&apos;s selection of fireproof file cabinets gives you the best protection with the configuration that is ideal for your work space. 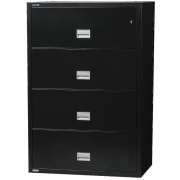 They are available in various styles with different numbers of drawers. With this arrangement, you can enjoy the benefits of fireproof files no matter what you need to store in them. What is the best way to secure irreplaceable documents? Don&apos;t take chances with irreplaceable documents such as birth certificates and drafts of old projects. 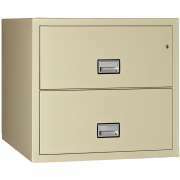 The extra protection you get from a fireproof file cabinet is worth the investment. There is nothing worse than losing valuable documents in a fire when you know that the damage could have been prevented. Who needs fireproof file cabinets? Extra protection is especially helpful in professional settings. Law firms and accountancy firms often have documents in client files that are challenging if not impossible to replace. When clients entrust experienced professionals with their irreplaceable certificates and work, they don&apos;t expect to be let down, even in the case of an unexpected accident. If there is no electronic copy of the work, or the forms include signatures that are impossible to replace, you certainly don&apos;t want to take chances when professional reputations are at stake. There is no need to compromise on organization or function in order to get the best security. 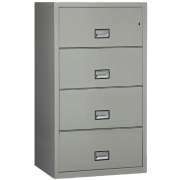 Fire protection isn&apos;t the only great feature that makes our steel filing cabinets so convenient. They are also designed to facilitate the organization that you need on a daily basis. With locking capabilities and an impact-resistant design, you can rest assured that documents are protected from a variety of potential mishaps. 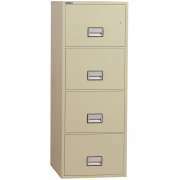 Should I get lateral or vertical file cabinets? 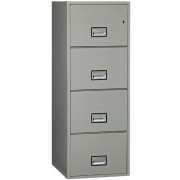 Once a company has determined that optimal protection is required, the next step is choosing the arrangement of the fireproof filing cabinet. We have both lateral and vertical files. 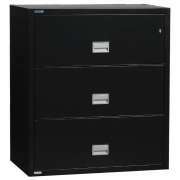 Lateral files fit more papers per drawer, but they have a large footprint. 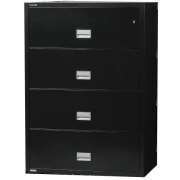 Compact vertical files have a smaller capacity per drawer but they take up much less floor space. Another consideration which must be taken into account any time fire proof filing cabinets are purchased is the matter of paper size. All models are designed for either letter- or legal-sized files. It is important to determine which of these is generally used in your workspace so you can choose the model that best suits your needs. 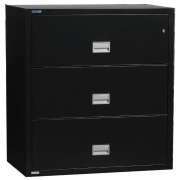 What is the best size for a fireproof file cabinet? Budgets and space arrangements are sensitive issues in any company. 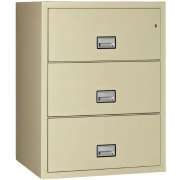 While investing in plenty of fire proof file cabinets is the ideal, it is understandable that some organizations will need to balance a number of potentially conflicting concerns and criteria. 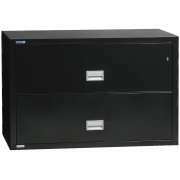 File cabinets come in compact two-drawer units as well as larger four-drawer models. With these choices, a company with a tight budget can still provide optimal protection for the most important documents, while a business with lots of sensitive materials can fill a whole file room with fireproof filing cabinets. 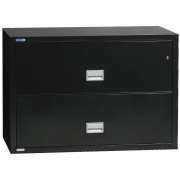 Sentry Safe file cabinets offer great protection. They keep documents safeguarded for up to an hour in direct flames. An independent inner vault in each drawer prevents flames from spreading if one drawer is accidentally left open. Hertz Furniture&apos;s selection of fireproof filing cabinets will keep your client papers secure. They are great for any professional setting. If you are having trouble deciding exactly how many fireproof files you need, contact the Hertz Project Solutions Team for free project-planning advice.